Garden Fresh Salad with Grilled Chicken and Buttermilk dressing. A healthy recipe that will provide a good amount of fiber and protein to your low carb diet plan. If you are looking for healthy lunch recipes, this easy simple salad recipe is for you! 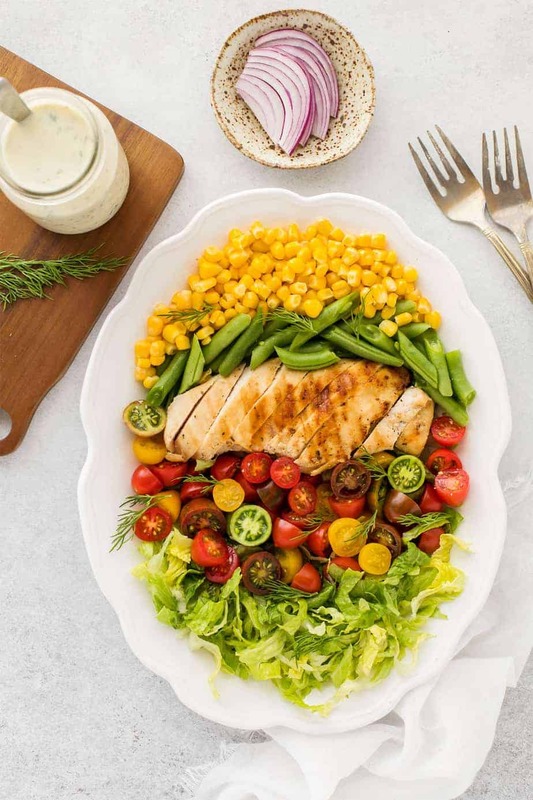 A complete lunch kit, made of fresh ingredients: corn, green beans, tomatoes, lettuce and red onion, served with grilled chicken breast and creamy buttermilk salad dressing that will add a tangy kick to it. It’s packed with nutrients and has a high water content, so this crisp salad will help you feel full for a longer period of time than many other salads out there. I served this garden fresh salad with juicy grilled chicken breast. I cut the chicken breast in half and I seasoned the chicken lightly with olive oil, salt/pepper and poultry seasoning. Then, I marinated in the fridge for at least 15 minutes and cooked it on a stove grill pan. While serving I drizzled some of my homemade buttermilk dill salad dressing with greek yogurt over the top which tastes great and helps for presentation, too. In a salad bowl, mix lettuce, green beans, tomatoes, corn and red onion. Add the chopped grilled chicken breast into the salad and drizzle with buttermilk dill dressing. Use less or more ingredients according to your liking. Season the chicken with olive oil, poultry seasoning, salt and pepper. Place chicken on a grill rack coated with cooking spray; grill 6 minutes on each side or until done. If you don't have any poultry seasoning, you can marinate the chicken in 2 teaspoons olive oil, 1/4 cup lemon juice, 1/4 teaspoon onion powder and salt/pepper to taste. That dressing sounds like it makes the whole meal! I am so excited to make this for my family! YUM. I never heard of buttermilk dressing before. Is it a healthy dressing? If so, I would so love to try this. Yes, I think it’s healthy because it’s packed with essential nutrients. Find low-fat buttermilk product with no other artificial ingredients. That grilled chicken salad looks absolutely amazing. I can’t wait to try your recipe for the dressing. I bet it would go well on so many dishes. There is nothing better than a fresh salad with home made dressing. I will be making this for sure. 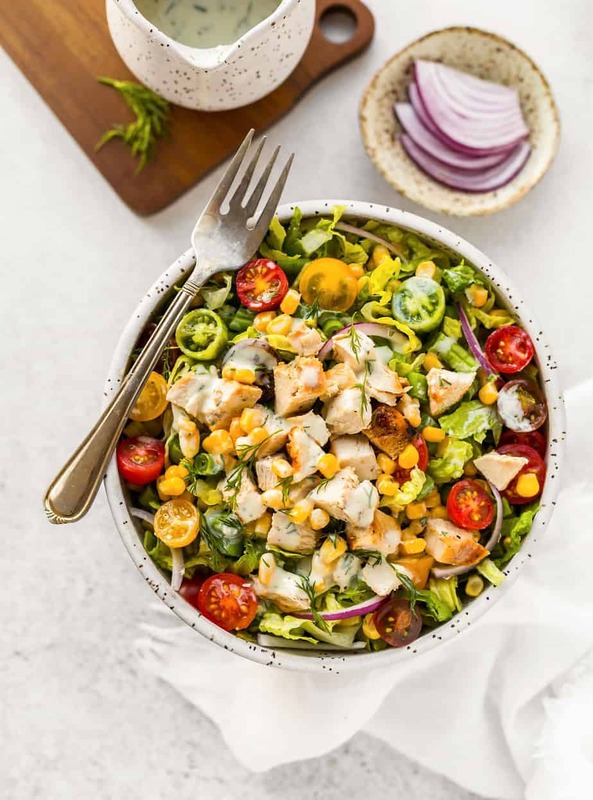 Garden Fresh Salad with Grilled Chicken and Buttermilk dressing is definitely going on my meal plan list for this week. It looks so delicious and easy to make. I am always looking for healthier recipes to try. I love the colors of the salad. Hubby is a big fan of buttermilk dressing so I know he’d be happy to find this on the table. That is beautiful! It’s awesome to learn recipes that make use of fresh ingredients like this especially during the summer! This is definitely perfect for lunch or dinner! I am loving that dressing. Oh how lovely! There’s nothing like grilled chicken on top of beautiful veggies when the weather is warmer! I think this is a must try and I’m sure the kids will like it as well. I always forget the croutons too! That dressing looks yummy! I know how dressings can make meals extra special. Thanks for sharing your recipe. I am new to cooking and learning it. I have been checking out blogs who has recipes and glad I came over this. Good thing that this is a healthy one. My husband needs a little diet and chicken breasts are suggested for him to eat and avoid meats. 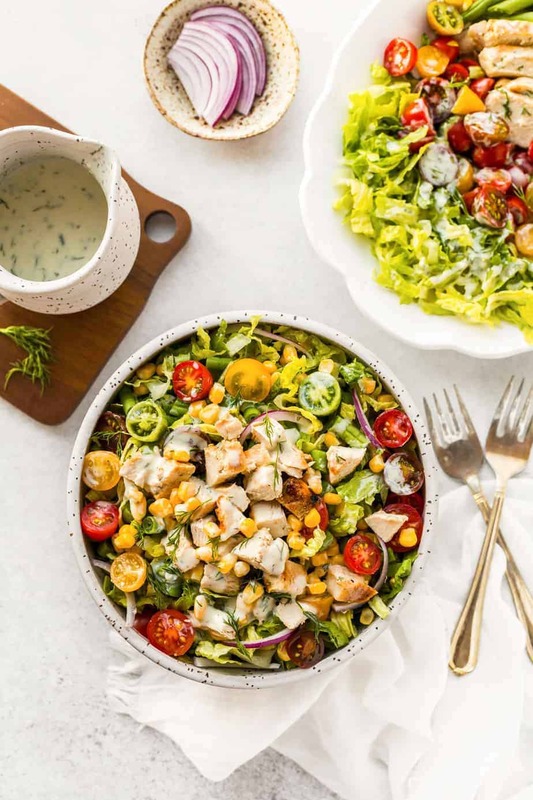 This garden fresh salad with grilled chicken and butter milk dressing sounds amazing. I don’t eat dressing but my family does so I would love to make the dressing for them. The salad is something I know I would love to eat and would make for a great lunch idea. Thanks for sharing the recipe. This is everything I want in a summertime salad! Fresh, light, but still filling and tasty. Gotta try this soon! I love a good salad and this one looks amazing! 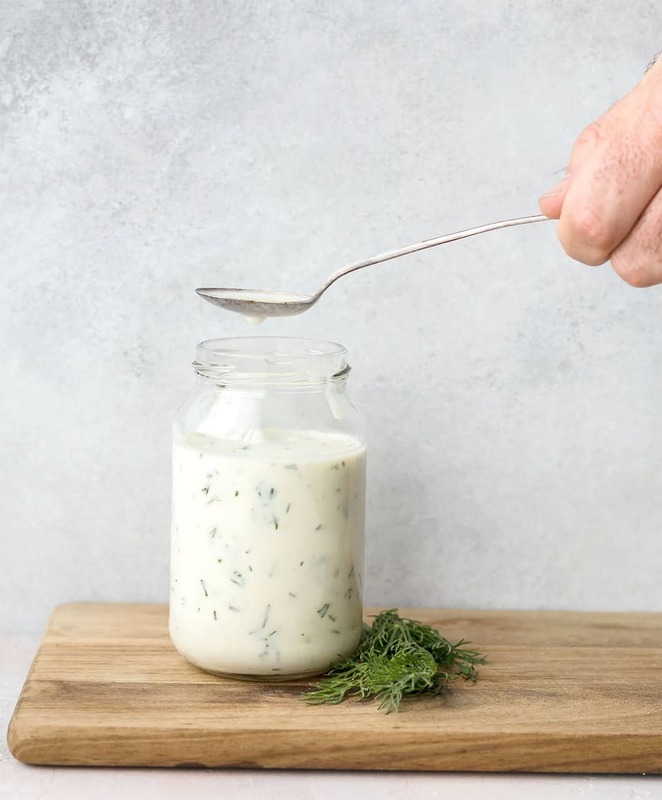 I want to try making this buttermilk dressing soon. I love to have salads in summer, they always seem so refreshing! I love the idea of making the yummy dressing! I was really interested in the Buttermilk dressing. I followed the link in the recipe and saved it for later. Thanks for sharing it. You can be sure it will be in a lot of the salads I make this summer. I love a good salad when the weather is warmer. This looks really good! This is the second recipe I’ve tried of yours this week. It’s really good, I like the dressing as it’s light yet still creamy enough. I added some extra asparagus in my salad, something I often do even if a recipe doesn’t call for it…. I recommend that slight tweak/addition as the buttermilk dressing pairs well with the crunch of asparagus.